August « 2014 « Geekorner-Geekulture. Count Cruhteo’s role in the story, at least thematically, appears to be over. He was here to make a choice, and that is how to react when he discovered the truth, of Asseylum being alive, would he go with honour’s demand that he save her and oust those who sought her death, or would he do everything to maintain honour, by going along with the plot? Well, he made his choice, and now he’s out. Poor Slaine keeps getting shafted just as each episode ends – being shot down, kidnapped, and having to shoot other people. Poor boy. Asseylum is now working with humanity, and had gifted them a fighting chance, to go with their poker-faced military boy-genius, Inaho. Let’s see where they go from here, fighting the Martians, trying to bring back peace? And how will the Martians react? Tensions run high, and the plotters will foster the suspicion amongst those who might listen. Screenshot album. Not 100% SFW due to the shower scenes. Hard to believe the pre-opening sequence was only 1:45 minutes long, considering how many mental turns I took there, and how packed it felt. I actually laughed out loud when it ended, and I think it could’ve gone even better had we had Lelouch Lamperouge, voiced by Fukuyama Jun, talking to Slaine, instead of ol’ Count Saazbaum. Well, they’re actually moving pretty rapidly. I’m not sure how they’re going to fill the 24 episodes. Maybe as some people assumed, we’ll get Excalibur as well this season. What I know for sure is that there’s going to be a lot of action, and reflecting on one’s past, from here on out until the end of the GunGale Online arc, at least. 1) “Knowing Kirito-san, I thought we’d see him all the time.” – They show fights, not people sitting on their asses, and Kirito isn’t one to not wade into combat, eh? But he’s here to work, not have fun. Well, I can understand the girls, they’re only watching because Kirito is playing, not like they’re invested in the game, and even when you care for the game it’s very different watching a player or a team when you’re rooting for them or against them, and when not invested at all, like watching western LCS or watching the OGN, if you don’t know any of the players (League of Legends). This week was alright? Thematically more shows that are generally lower on the pole did well, but there was nothing that wowed me. The order is roughly by how good/how much I liked the episodes, but aside from Fate/Kaleid which was terrible, most of the shows are pretty interchangeable this week. Weekly impressions for Akame ga Kill!, Aldnoah.Zero, Barakamon, Fate/kaleid liner Prisma☆Illya 2wei!, JoJo’s Bizarre Adventure, Sword Art Online II, Tokyo Ghoul, and Zankyou no Terror (Terror in Resonance) (Also, Avatar: The Legend of Korra, including finale!, and previous weeks’ Gekkan Shoujo Nozaki-Kun and Sabagebu!). Link in titles leads to full-episode write-ups for Aldnoah.Zero and Zankyou no Terror. Before I get to anything else, there was a noticeable dip in drawing quality in this episode. Faces and figures were not drawn to the usual standard, with a lot of off-model shots. This piece was a long-time coming. The nugget of realization came early, but realizing what exactly bothered me took some more time. For those who don’t know, back in 2009-2010 this blog had regular content about anime figurines, including a few figure reviews. The topic of what to provide in my post, and the nature of how I perceive most blogs at the time to handle their take on mass-produced content also carried to why this blog doesn’t really have episodic content, and certainly didn’t in the past. Look at a fan’s review of a figure, what do you see? 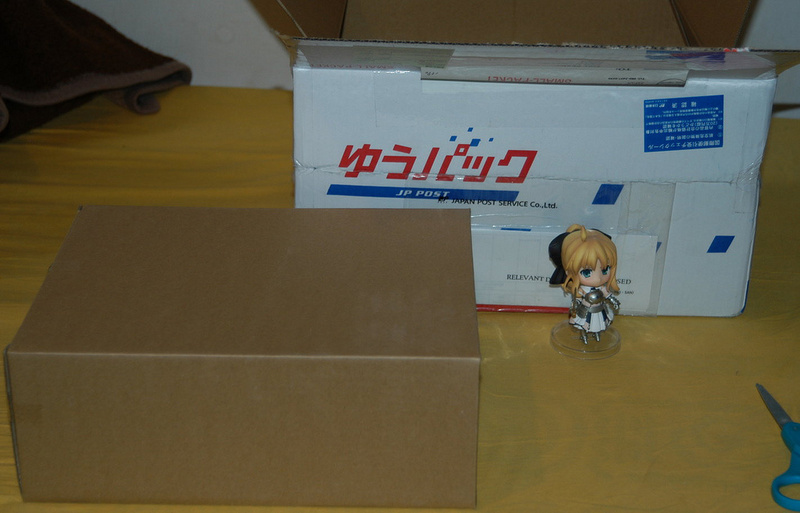 You see them taking shots of the box in which the figure arrives, you see them unpacking said box, and then you see numerous shots of the figure that’s being reviewed. You might not get “unboxing the box”, but for most such reviews, that’s what you’re going to get. So, what’s the problem? Well, there isn’t exactly any problem, but head over to YouTube, search for a review of a gaming mouse, keyboard, or even a food processor, and you’ll see more or less the exact same thing. That’s still not a problem, it just means that all these items are presented the same way, right? Well, here’s where we’re getting to the problem – it’s a culture of mass-producing “reviews” of mass-produced items. And like all mass-produced items, there’s not much to differentiate the items, both the products being reviewed, and as a result, the reviews themselves. This show has slight pacing issues. It feels as if they want to reach the first half’s finale at a certain point, which requires slight padding. Last episode had solid action, but most of the content within it could’ve been covered in considerably less ground. What did matter last week? Humanity now has the power of Aldnoah on their side with Princess Asseylum’s aid, and Inaho shot down Slaine. Here is me going through why Inaho shot down Slaine, and what their little dialogue meant(Section 4, “Inaho’s Choice”). I’ll probably not do a super long note-taking write-ups for this show from now on, but rather focus on scenes as a whole. 1) “Deucalion,” the son of Prometheus (he who gifted humanity with fire), he built an arc, an equivalent to Noah’s Arc. So this ship is the last hope of Earth, so to speak. A fitting name. Hidden for a rainy day, when a “rain” will pour to wash away all life on this planet, a rain of debris from the moon, a rain of Orbital Knights. Why did they do it? So that this week’s episode would get to start with a bang, and get to continue full-steam ahead, without the episode-break coming at an inopportune time. Well, let’s see how they managed. I expect a pretty brisk episode. 1) Considering that my biggest complaint with last episode is how much of it felt stretched, that up to 4:12 minutes into this episode it’s all content from last episode aside from the OP feels like adding insult to injury. You make that content take even more time, eh? Well, I guess it fits with how they need all of the content shown to fit into one episode, and were wary of splitting it up. Show me what you’ve got, show-makers. Because last week I’ve covered the mid-season, this week the post will cover the last two weeks’ worth of episodes. The order will be arbitrary. Weekly impressions for Akame ga Kill!, Aldnoah.Zero, Barakamon, Fate/kaleid liner Prisma☆Illya 2wei!, JoJo’s Bizarre Adventure , Sword Art Online II, Tokyo Ghoul, and Zankyou no Terror (Terror in Resonance) (Also, Avatar: The Legend of Korra). Pretty great stuff. This dealt with the search for the top, and with how precocious people can be so annoying to deal with, especially when you used to be one yourself, and you see in them how annoying you used to be – eager to challenge and chase everyone.